Aurelien Collin scored in the 76th minute and converted Sporting Kansas City’s tenth and final penalty to give his club their first championship since 2000 in Saturday’s 1-1 (7-6 on PKs) win over Real Salt Lake at Sporting Park. Collin answered Alvaro Saborio’s 52nd minute strike to send the match into overtime, where it remained knotted at one before penalties were employed. It took ten rounds to decide the championship tilt, with Collin’s hit deciding it after Lovel Palmer’s shot hit the crossbar. A pair of former New England Revolution players – midfielder Benny Feilhaber (2011-12) and left back Seth Sinovic (2010-2011) – both earned their first championship rings in Saturday’s clash. After a scoreless first half, the guests jumped onto the board minutes into the second frame. Kyle Beckerman lofted a perfect pass over the Sporting defense for Saborio, who then slid it past Jimmy Nielsen before a stunned Sporting Park crowd. 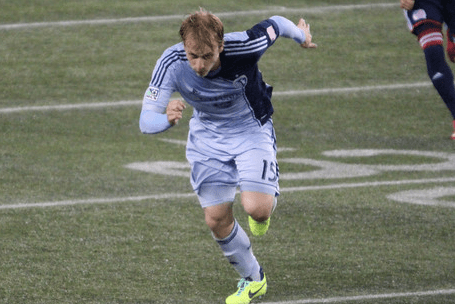 But Collin, who scored a pair of goals in the Conference Semifinals against the New England Revolution, added his third of the postseason when he elevated above two Sporting defenders to head Zusi’s corner kick out of the reach of Nick Rimando. The match remained level at the end of regulation, forcing the championship affair to overtime. However, the extra 30 minutes did nothing to separate the sides, and penalties were introduced. What transpired next was nothing short of high drama. Both sides remained knotted at 3-3 after the first five tries, and five more were needed befoe a victor emerged. Collin knocked his try true before Palmer’s attempted crashed off the crossbar and turf to seal Sporting’s second championship in club history. Indeed, Collin probably would have been sent off for a second yellow shortly before his goal had it not been a Cup final. But, as we’ve seen before – and with good reason – refs don’t often issue reds when the stakes are high. That said, I’d hate to see a sin bin/penalty box for players who get cautioned. Makes it look much like hockey and indoor soccer, IMO.